Ratu Boko temple Yogyakarta. Come to Ratu Boko temple and discover a Yogyakarta stunning view when the sun goes down, the golden twilight comes out from the west horizon which raises peace and mystical situation. Ratu Boko temple sunset, definitely memorable sunset at unforgettable moment. Ratu Boko temple Yogyakarta. 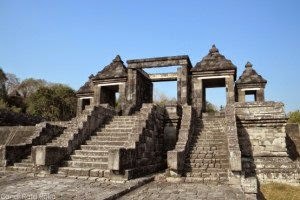 Ratu Boko temple is an archaeological site in the form of royal palace of Old Mataram Kingdom from 8th century, used by the Sailendra Dinasty, long time before establishment of Borobudur an Prambanan temple. According to the ancient inscription that was made by Rakai Panangkaran in 746 - 784 AD, previously named as Abhayagiri Vihara. From Prambanan temple, it is only about three kilometers southward to reach the compound of Kraton Ratu Boko temple. The temple is more like an artistic palace than common temple. It can be seen from the gates and the other attributes that are now still beautifully standing on the area. Ratu Boko temple Yogyakarta. The complex is located 196 meters above the sea level. On the highest point of the site, there is a small pavilion where we will be able to see a beautiful panorama of Prambanan temple with Mount Merapi as the background. This site covers 16 hectares in two hamlets (Dawung and Sambireja) of the village of Bokoharjo, Prambanan, Yogyakarta, Indonesia. Ratu Boko temple Yogyakarta. Different from other temples in Yogyakarta and Central Java, the site of Ratu Boko has a special characteristic. Common monuments in Yogyakarta and Central Java usually consist of temples (holy building), however Ratu Boko temple compound has no holy buildings (temples) and even has several profane buildings. It can be seen by building used as living place such as pool and cave. The temple offers you a splendid atmosphere. You will see and discover a stunning view when the sun goes down, the golden twilight comes out from the west horizon which raises peace feel..
Ratu Boko temple sunset ticket : IDR 375 K per-person. Price maybe change without prior notice. King Boko is a legendary character known from popular folklore of Loro Jonggrang. This folklore connects the Ratu Boko Palace, the Durga statue in Prambanan temple (which is identified by local folklore as Loro Jonggrang), and the origin of the Sewu temple complex nearby. Prince Bandung Bondowoso loved Princess Loro Jonggrang, the daughter of King Boko, but she rejected his proposal of marriage because Bandung Bondowoso had killed King Boko and ruled her kingdom. Bandung Bondowoso insisted on the union, and finally Loro Jonggrang was forced to agree for a union in marriage, but she posed one condition: Bandung must build her a thousand temples in one night. He entered into meditation and conjured up a multitude of spirits (genies or demons) from the earth. They succeeded in building 999 temples. Loro Jonggrang then woke her palace maids and ordered them to begin pounding rice. This awoke the roosters, which began to crow. The genies, hearing the sound of morning, believed the sun was about to rise and so disappeared back into the ground. Thus the prince was fooled, in revenge he cursed the princess and turned her into a stone statue. According to the traditions, she is the image of Durga in the north cell of the Shiva temple at Prambanan, which is still known as Loro Jonggrang or Slender Virgin. The first of three terraces is reached through a massive gateway built on two levels. On the western edge of this terrace is a high talud of soft white limestone. The second terrace, separated from the first by andesite wall, is reached through a gateway in paduraksa form consisting of three doors, a larger central one flanked by two of lesser dimensions. The third terrace, the largest, contains the richest concentrations of archaeological remains. It is read on the main gate Panabwara that was written by Rakai Panabwara, descendant of Rakai Panangkaran. He carved his name there in order to legitimate his authority of this palace. Beyond the second row of gates on third terrace, on the north side of the plateau there's a structure similar to the base part of the temple with two terraces about 26x26 m in size. On the center of upper terrace is just an empty descending square hole. The function of that building probably as the crematorium to burn the corpses. 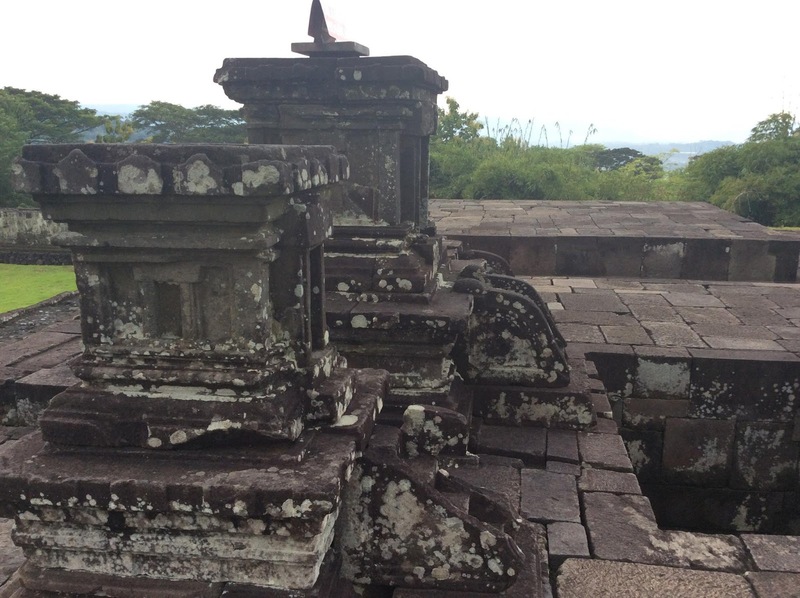 On the plateau on third terrace, beside the Candi Pembakaran, there's also several square stone structure. On the structure there's some umpak or stone serve as the base of wooden column with hole to erect the pillars. On the second terrace on the southeast side of the plateau, lies the pendopo (audience hall). 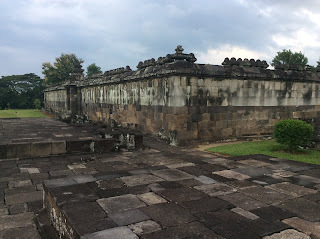 The pendopo is a square stone enclosure surrounded with andesite stone wall with the small paduraksa entrance gates in north, west, and south side of the walled enclosure. In the center of this walled enclosure there's a stone base formed by two separated terraces, the terrace in the southern side is smaller than the north side one. This terrace served as the base and floor of the wooden structure since there's some umpak or stone serve as the base of wooden column with hole to erect the pillars. On eastern side of pendopo on lower terrace, there is several andesite stone walled enclosure with paduraksa gate and gallery lead to the several pool within the walled enclosure. This structure is associated by local folks as kaputren (women's quarter), since the pool believed to be the pleasure garden for king and his concubines. One particular pool (or well) within the bath place is considered sacred by Hindu people called 'Amerta Mantana'. It is believed that the water of Amerta brings luck for anyone who uses it. Hindu people use it in Tawur Agung ceremony, one day before the Nyepi day, to support the achievement of self purify and to return the earth into her initial harmony. To the east of the pool there's two stone base structure, yet again probably the remains of wooden structure which only the stone base still remains. At the northern part from pendopo, isolated from the rest of the site, lies two caves that were formed of sediment stones. The upper cave is called Gua Lanang (Male Cave) and the lower cave is called Gua Wadon (Female Cave). 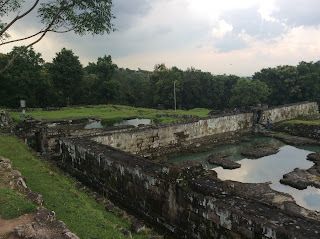 The pendopo, the three temples, the pools and the kaputren are located on the south east. The existence of these buildings indicates the characteristic of a royal palace. Nowadays, the site’s name, the architect, and the function of the temple remain uncertain. Some people believe it was the former palace of ancient Mataram Kingdom or a fortress; other scholars interpret this site was a monastery. The other group presumes it was a place for rest and recreation. All of the opinions above were unclear, the local folks believe that this site was King Boko’s palace; the legendary character mentioned in Roro Jonggrang myths and named it after him.